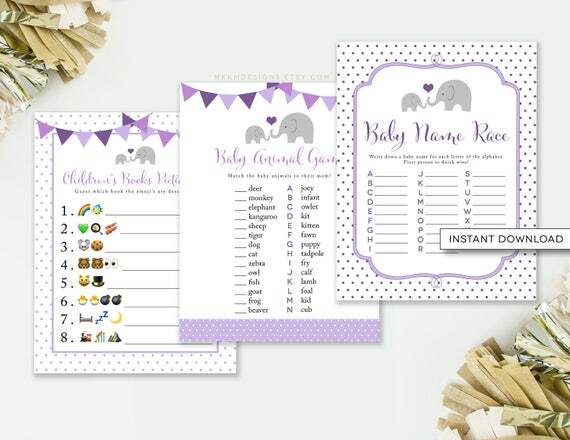 This listing is for a variety of baby shower games in our Elephant shower theme. Games include: Baby Animal Matching, Baby Name Race, and Children's Book Pictionary with Emoji's. ►PDF and JPEG files of PRINTABLE digital shower games, no printed items will be mailed to you. This Listing is NOT customized. Download includes zip folders. You must be able to access zip folders in order to access all files available with this listing. Included are a single JPEG/PDF file and set of 2 games per page PDF file. Includes 8.5x11" Full size pages and 5x6.5" half size cards. ►DESIGN CHANGES: This listing does not include any color, size, font, layout, language, or graphic changes. Differences in computer monitors and printer quality may cause the colors you see on your screen to vary slightly when printed. If you would like to make color, size, or wording changes, please contact us for a custom design quote.